The Barracuda 9 combines innovative design, speed, performance and safety all at once. This sport fisher enjoys perfectly controlled power and her interior is designed for cruising. This makes her a particularly attractive choice. The Barracuda 9’s hull is aggressive yet safe and she is perfectly balanced. Equipped with Air Step© technology, she is very comfortable to drive and her chined hull gives her great grip. Topped with a stylish straight wind-shielded wheelhouse, her deck has a walkaround layout. 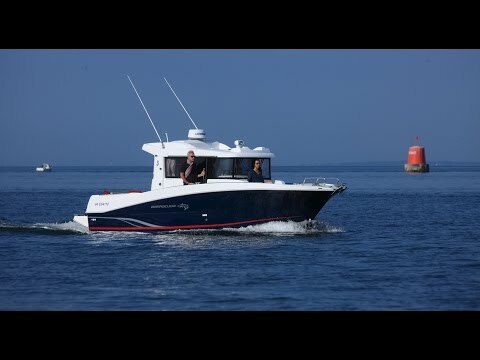 This boat is designed for fishing and has spacious functional ‘work areas’ outside (cockpit and foredeck). The Barracuda 9 boasts a version with a second driving station on the flybridge. Ideal for easy movement on board, access to the wheelhouse is by two side sliding doors. Inside, the Barracuda 9 reveals a really comfortable atmosphere. With a dashboard ready to receive full electronic equipment, a large forward cabin, and a shower and toilet space, it is ready to set off on any trip. Every hollow space is used as a storage locker and for stowing equipment. The two pilot and co-pilot bolster seats rotate to face the rear seat. This creates a meal area inside.